A few hundred yards down the shore from yesterday's scene is the entrance to Seal Bay, the "backdoor" as I call it. At low tide you can't even get a dinghy through this, but at full tide, it is gorgeous. One time when we passed through here, there was a guy sitting on the big rock in the passage reading a book. What could be better on an August afternoon? I like this one better, just four shades of gray, yeah! The photo is from one of our sailing trips to Penobscot Bay. This is the shore of Vinal Cove in eastern Vinalhaven Island, near the backdoor entrance to Seal Bay where we moor our boat. The kids love to take a dinghy at high tide through the backdoor channel into Vinal Cove, where there is a wonderful tidal flow, and run the dinghies up and down the rapids. It is such a beautiful place! I have been reading Bob Rohm's "The Painterly Approach" (available on amazon.com). 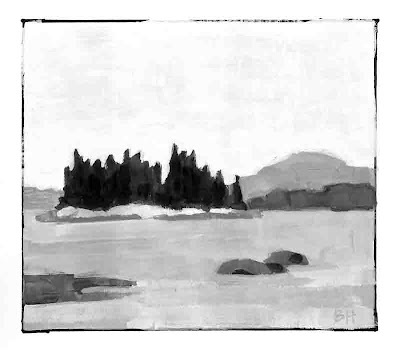 I was taken with his description of Carlson's proposal that four values are sufficient to interpret a landscape. I spent a little time going through photos, looking for appropriate scenes to try this with. This is my first attempt, in gouache. Looks like I have five values here, so I didn't quite make it, but it was an interesting challenge. I used the color photo as a reference and then when I was done compared it with the photo made grayscale in Photoshop. Not bad. One rainy day last week I spent some vacation time working with my niece and cousins on pet portraits, inspired by my friend Elizabeth Fraser's work. We were lucky to have three new puppies in the neighborhood, and got some good photos of them to use as reference material. These are the results of Jessica, Eli, and Rose's efforts (two of them are not quite finished, and will be completed at our next visit). 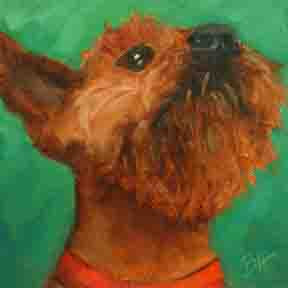 I haven't posted about this until today, because that was the first chance I got to finish my portrait, which is of our Airedale, Macintosh (above). He is looking with longing at one of his toys, placed on a beam above our heads by my son. And here we are in a group photo. There was actually a larger group, because my mother-in-law, aunt, and cousin got so interested in the drawing part of our process, that they asked for sketchbooks too! It was pouring today, so there was no painting outside. After wiping off a more complicated still life, I settled on this simple composition. I have been unhappy with my painting photography and thought today was a good one for some experimentation. The two photos above show two different cameras and processes, both taken with the painting in the same lighting. The top view was with my 3.3 megapixel 9 year old Olympus, followed by adjusting the levels in Photoshop. The lower view is from my friend Suzanne's Pentax with minimal processing using the HP software from her printer. Several photos were taken with each camera with different white balance settings and we chose the result that best matched the color of the painting, which turned out to be the auto setting. Is it time for a new camera? "Apple and Banana" is a 6"X6" oil. Homage to Postcards from Detroit - "CMP Wyman Station"
A couple of weeks ago my friend Suzanne sent me to Stephen Magsig's "Postcards from Detroit" blog, where he posts his small paintings of abandoned buildings and commercial structures such as bridges and factory buildings. They are just awesome, and I immediately started following the blog. I love the way Stephen captures the sense of these scenes and his spare painting style. We have such a structure here in Yarmouth, visible from near my house and all around Casco Bay. I had thought before of painting it, because it has a nice blocky feeling, industrially interesting. 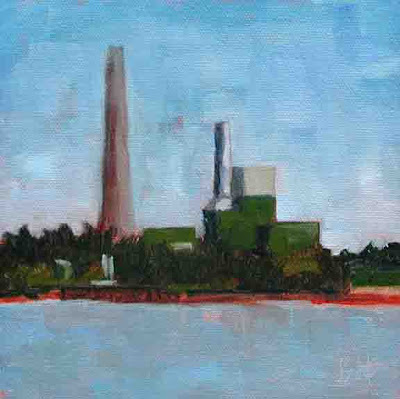 Suzanne and I were outside the other day, and Stephen's blog inspired us to paint what we all refer to as "the power plant", but was named CMP Wyman Station. (CMP stands for Central Maine Power, Wyman was it's founder.) 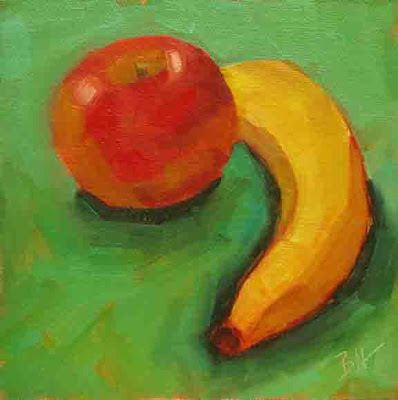 The painting is a 6"X6" oil. We are on vacation this week, and our cottage and the family cottage are full. Lots of fun with everyone here together. It has been great to get up early and paint on the float at the dock while the others are still asleep. This cottage is just down the cove. 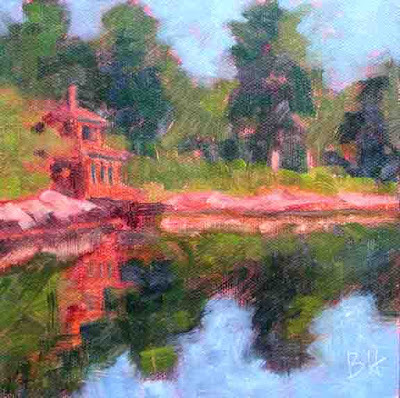 "Cottage Reflection" is a 6"X6" oil. It took a couple of sessions, but here's my Sou'wester hat. Those of you who know this hat will recognize that we are looking at the back, which has a wide brim to keep the rain off your neck in bad weather. I have only worn this one a couple of times, plastic not being my favorite material. I had a great waterproof nylon sailing hat, with a somewhat wide brim all around that worked in sun and rain, but it got left behind on someone else's boat a long time ago. My husband still has his blue version. It might be on my list... And yes, the cantaloupe is still under there. 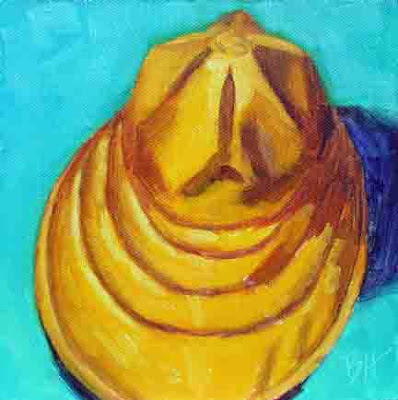 "Sou'wester Hat" is a 6"X6" oil. In my search for a paintable hat to wear for the upcoming portrait challenge (see previous hat post) I thought of my old sou'wester, appealing because of the bright color and big brim. After five drawings and the help of a cantaloupe I finally had something that my sailor husband recognized. I wonder if painting it will be as challenging? Today I painted with my friend Suzanne at Wolfe's Neck Farm in Freeport. What a great place to paint! We were down on the water at the campsites, though the salt marsh by the bridge was also tempting. We took lots of pictures that will come in useful this winter. This is the view southwest, the point of land with the tall trees is another part of Wolfe's Neck with South Freeport Harbor around the corner behind it. 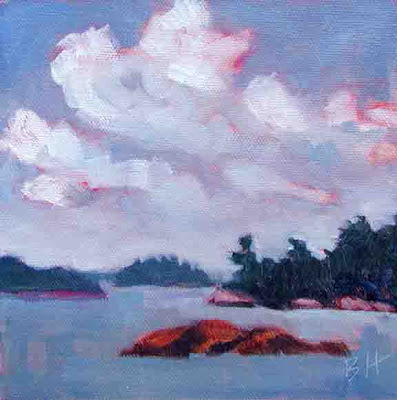 "From Wolfe's Neck" is a 6"X6" oil. This cove in Townsend Gut is just to the west of the swing bridge between Southport Island and Boothbay Harbor. It is a beautiful place where boats heading east line up to wait for the bridge to open. This was at about half tide, when some of the dark intertidal rocks are visible, and the waiting boats had just headed through. A quintessential Maine summer scene. 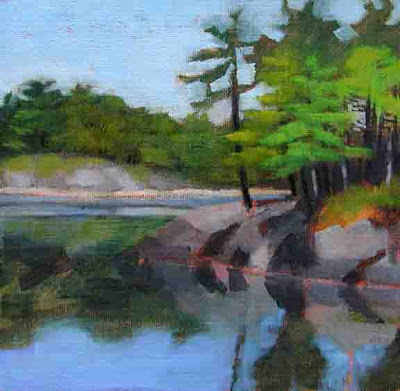 A boating friend, who has been through this area, saw the painting on my easel and said, I want that one! 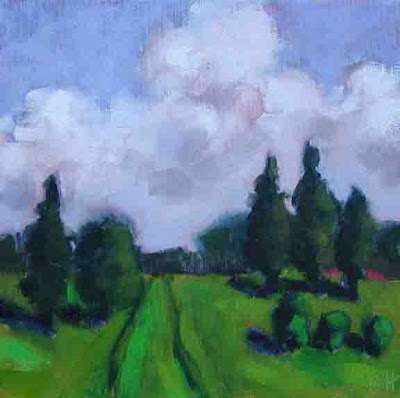 "Townsend Gut" is a 6"X6" oil. Here's my oil version of the felt hat. What do you think? I think it will be harder when my face is included (see previous post). 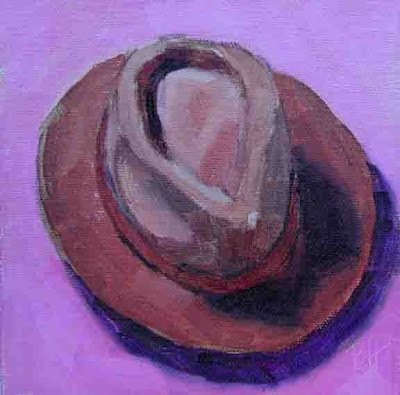 Felt Hat is 6"X6". Hats off to David Lobenberg! If you have been following David Lobenberg's blog you will remember his "Self Portrait Global Love In" where artists from around the world contributed paintings of themselves. Well, David is at it again with a new self portrait challenge. Take a look at this blog post to see who gave him the idea for the new one. I am already reviewing my hats, scarves, and turbans (well I don't actually have a turban) to choose something to wear for this challenge. 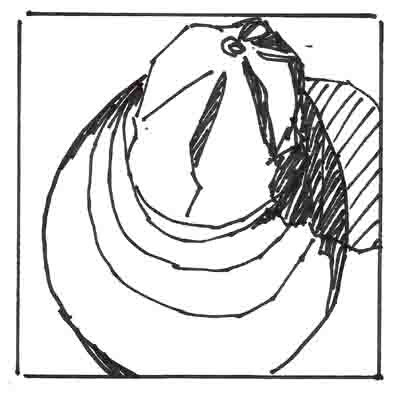 The sketch above is a hat I bought some time ago at LL Bean. 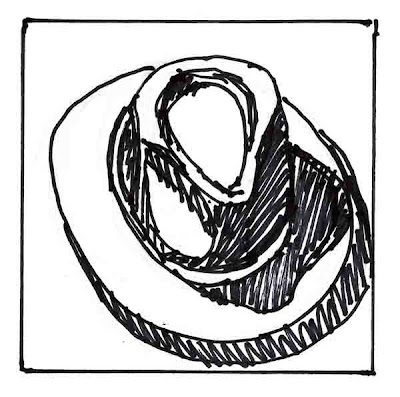 I liked the nice wide brim on a winter felt hat. I will try to paint it as shown above before I try to do it with my head inside. This painting started in the Botanical Gardens on Sunday, and got a rework this morning. Originally it contained one of the beautiful iron deer sculptures, but the composition was lacking, and it just didn't work. So now the trees in the center take the place of the sculpture. As my son said when looking at the first version, "either there needs to be a real deer or no deer". I like this one better. 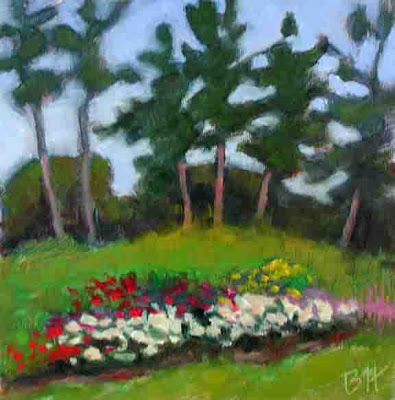 "Garden Trees" is a 6"X6" oil. With this post I am adding the Google Follower element. When I first set up the blog I debated whether to include that element or the email subscription feature, thinking I only needed one or the other. Now that I understand the follower feature better, I see the value of both. It is great to get an email from the blogs I love when there is a new post, but all blogs don't offer the email subscription feature (and sometimes when a blog offers it, it simply doesn't work). If you follow more than a few blogs, the follower feature gives you a dashboard that shows them all, and lets you see at a glance if there is anything new. It works for any blog, not just those hosted by blogspot, which is convenient. This works for me, since I track maybe 10 art blogs at this point, and the number is steadily increasing. So if you want to give it a try, join my followers. I have added a list of the blogs that I follow as well, in case you are looking for some great reading and awesome paintings. Many thanks to JanettMarie for being my first follower. She has been following my blog since the beginning, though that was only visible to me. Today was the Coastal Maine Botanical Gardens Plein Air Painting Day in Boothbay Harbor and the weather was great! About 60 artists participated and the gardens looked lovely. I was particularly taken with the wonderful sculptures and couldn't resist a scene that included this beautiful example, which gets a lot of attention from the visitors. It turns and flexes in the wind and the fronds are always moving. I hope I give a flavor of that in the painting. 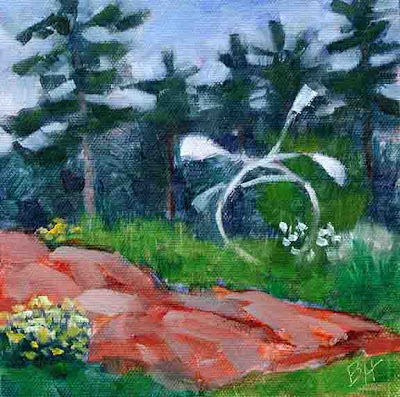 "Garden Scultpure" is a 6"X6" oil - SOLD. 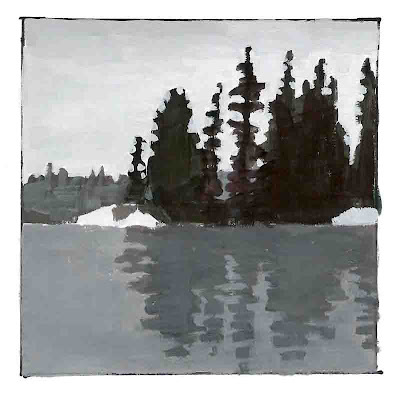 As promised, this is the 10"X10" demo painting from yesterday's opening. It took about an hour and half to complete, with plenty of good advice from the onlookers (most of which I followed!). It was great fun once I got started. We got held up in traffic and arrived a few minutes after the demo was planned to start, so I set up in a rush and had a moment of panic when it was time to begin. I went over the source material; a photo, a value sketch, and the two previous paintings, explaining what drew me to this scene, and what I liked and disliked from the previous efforts. 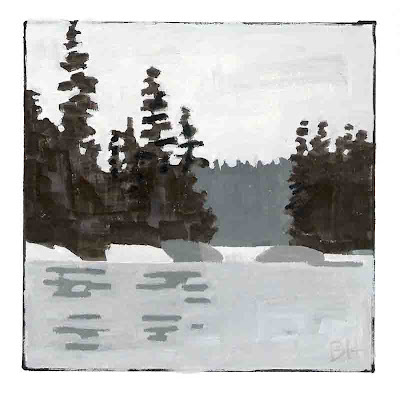 I tinted the canvas, then did a quick drawing, and we talked about the composition. Then I blocked in the trees, bushes and clouds with paint thinned with Gamsol, followed by a reshape of those objects with the grass and sky colors. At this point we did another review of the composition and I got some great comments and made a few adjustments. This was followed with adding darker darks and lighter lights (using a small amount of linseed oil with the paint), leaving quite a bit of the first layer showing. That was it, and I think I like this version best of all. The opening at the Gallery at Boothbay Harbor was this afternoon, with a First Friday Art Walk afterward. 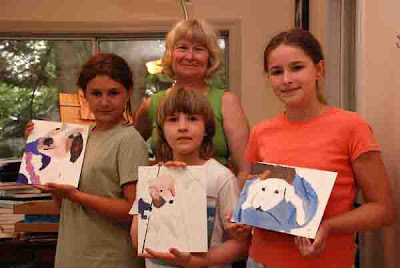 The paintings look great (thanks, Pandy!). We had lots of nice people stop in. The demo was fun. I will post the painting tomorrow, since we didn't think to take a photo of it in all the excitement. Thanks to all my friends and family for turning out, and for braving the drive through Wiscasset on a summer holiday weekend.